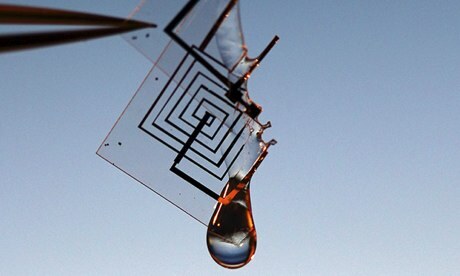 Electronic devices that biodegrade to order could lead to huge medical advances. And the Pentagon, through Darpa, is investing heavily in ‘born-to-die’ technology too. Read my latest colour double page feature for The Observer and online for The Guardian in full below or by following this link. It was on The Guardian’s homepage all day. Click to see its syndication to The Japan Times as well. The fingernail-sized integrated circuit made from silicon, magnesium and silk takes just one minute to disintegrate upon contact with water. Imagine recovering from an operation without fear of a post-op infection from a drug-resistant super-bug. Imagine that this is because of a tiny electronic device left behind when they sewed you back up, which monitors the wound, picks up signs of infection, administers a specific amount of heat to the right area and then, job done, disappears into your bodily fluids. Imagine, too, an oil spill clean-up being monitored by 100,000 sensors dropped from a plane that would dissolve into the water when it was all over. Or a no-longer-loved smartphone that could actually dissolve down the sink rather than clog up your desk drawer. Then imagine what the military could do with these so-called born-to-die devices. How about electronic eyes and ears that couldbe deployed for black ops in a war zone and then be triggered to dissolve when their mission was over or when they were about to be discovered? And finally, realise that this isn’t science fiction from Orson Scott Card, the writer of Ender’s Game, but rather current tech funded by Darpa, the Pentagon’s Defence Advanced Research Project Agency, who are the nice people working hard to make autonomous killer robots a living nightmare. In one video of this born-to-die technology, when water drops hit the fingernail-sized integrated circuit its see-through silk substrate quickly starts to curl up, causing the strands of silicon and magnesium that make up its circuits to peel away. After just one minute, what had been a fully functioning board, with transistors, diodes and capacitors, is now just a long, thin, dirty strand of gunk. In another video, it takes just two hours for the integrated circuit to dissolve in a glass of water. In 2012 a transient device was implanted in the body of a mouse and powered wirelessly. The device was able to produce enough heat to kill off the bacteria that cause post-surgery infections. It lasted two weeks and then dissolved into the mouse’s bodily fluids with no obvious side-effects for the mouse. Now, Professor John A Rogers believes that we may be only “a year or two away” from testing biodegradable electronics in humans, albeit in surface wounds (for which the regulations are lighter). 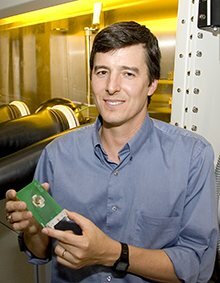 Rogers is head of the John Rogers Research Group at the University of Illinois at Urbana-Champaign, and one of the leading researchers into the development of these born-to-die electronic devices. It is his and his colleagues’ work that is featured in the videos. However, there are a number of significant challenges that Rogers has to overcome, including trying to work out whether having a piece of electronics that dissolves in our bodies harms our health. There is even the tricky issue of how a water-soluble piece of technology can be mass-produced in a production process that conventionally uses a lot of water. Beyond that, there is the power problem: wireless power transmission is good for devices near, or on, the body surface but not so useful when they have to be implanted deep in the body. Further ahead lies another thorny problem, and one that is vital for the widespread use of the technology: how to get these devices to die on demand – and in substances other than water, so that the Pentagon doesn’t have to wait for rain before the evidence of its covert work disappears. Rogers has tried to get round many of the problems that hold up innovative new technologies by trying to reuse “as much as possible of the stuff that is already out there for semiconductor manufacture” for the mass production of his transient electronics devices. He has also tried to use materials that already have FDA approval to cut out more potential hold-ups. For example, the integrated circuit shown in the videos uses slices of silicon (silicon nanomembranes) so thin that they will dissolve in water; magnesium rather than copper as the conductor (since magnesium is non-toxic in small quantities and, indeed, an essential nutrient in the human body); and layers of silk to encase the whole device. Its lifespan is determined by the thickness of this silk substrate. The device is wirelessly coupled with an external power source, but in the future it might be powered by the movement of the body, and even have its transience activated remotely. Other materials, including zinc oxide and bioresorbable polymers already FDA-approved, can work in transient technology as well, giving Rogers “a wide palette of materials to work from”. Now he is pretty confident that he has materials that can make transient electronics do “meaningful things”. While Rogers has had “some amazing first demonstrations”, says Michael McAlpine, assistant professor of aerospace engineering at Princeton, the challenge is, he believes, to build a transient device “where there aren’t just, say, 10 transistors but the billion that you find on a real chip”. Then, for McAlpine, there is also the small matter of how well you can control exactly when the sensors will live or die, which “is critical for the applications” envisaged for the technology. This is called tunability: the ability to decide when the device will dissolve “so you can keep it for as long as you want”. Professor Michael Dickey, of the faculty of engineering at North Carolina State University, says Rogers’s achievement is “pretty remarkable”. One of the “most elegant things” is trying to use conventional materials in an unconventional way so that transient devices can be made in a bog-standard electronics factory. “Then manufacture them very thin so they are easier to make go away. When you work on very thin substrates you can do all sorts of neat things that have been impossible to do with a silicon chip.” For Dickey, the ability to apply this born-to-die technology to more complex tasks isn’t too much of an issue as “they are not competing with Intel in terms of sophistication of the electronics”. Yet, says Dickey, “the devil could be in the detail. Every time you go into a new area there is no road map for you to follow.” In particular, “they didn’t demonstrate in their original work” that there could be triggers other than water for the device to dissolve in. Triggers such as a remote signal are particularly important for its wider application, whether monitoring an oil spill or movements on a battlefield. “This concept is incredibly novel and a big deal,” says Teri W Odom, professor of chemistry and of materials science and engineering at Northwestern University, Illinois. However, she thinks that “there are many design constraints” that have to be overcome before they can breathe life into the technology, such as “the dissolution rates of the layers, the types of materials used to conduct electricity, and the types of materials that can be used in the transistors. One limitation could be whether it would be possible to build in a power source on the electronics themselves instead of relying on external sources”. While Rogers accepts that significant challenges remain, they are trying to adapt production lines “that have been designed to manufacture technology that lasts for ever” to make something that might die after two weeks. He argues that as yet unpublished research will demonstrate that transience in dry conditions is possible and that he “can even trigger dissolution remotely, using a radio link”. As well as remote control, other triggers Rogers says are possible are “mechanical shocks, temperature change, light exposure and chemical-biological”, all of which are more suitable for battlefield conditions or a pollution incident than water. The lab has also developed batteries for transient devices that can dissolve in bodily fluids so they can operate more independently. Quietly confident, he states: “it is still very early stages, but we are very optimistic that transient electronics will represent a big breakthrough”. Next Heat engines: Stirling Silver?